This class is suitable for all skill levels from beginner to experienced. The sampler style of the project allows students to learn a variety of embroidery stitches. More advanced stitchers can develop their existing skills by incorporating techniques such as lacing or couching for fun new effects. Students will take away either a completed embroidery or a finished embroidered drawstring pouch, depending on the class length chosen. During the class, students should discover how relaxing and therapeutic embroidery can be. A photo of Circles Drawstring Pouch can be found on p. 72. 3 hours: The class can be offered as a shorter embroidery class where the focus is on learning basic stitches or developing stitching skills. 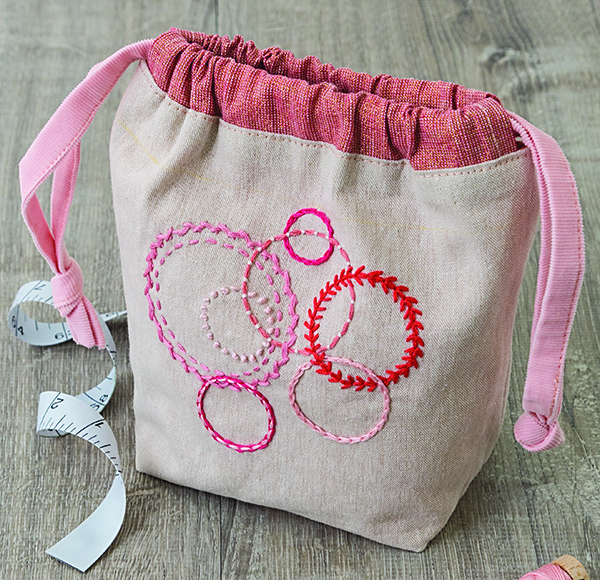 Students complete the embroidery in class and can finish by sewing the drawstring pouch at home. 6 hours (two separate 3-hour sessions): In the first session, students will make the embroidery, then take it home to wash away pattern marks and dry; in the second session, students will sew the finished piece into the embroidered drawstring pouch. Note: If using Yarn Dyed linen, dark-colored quilting cotton, or other fabric that is difficult to see through enough to trace the design, the student will need 1 sheet C&T Publishing Wash-Away Stitch Stabilizer printed at home (see p. 15 for instructions) with the Circles design and brought to class. Alternatively, the class teacher could print copies onto the stabilizer and hand out to students during the class. • Fabrics such as solid-colored cotton lawn and corduroy for linings etc. 3-hour class: Each student will require table space for hand stitching. One ironing station is required by every six students for pressing fabric prior to stitching. 6-hour class: For the first session requirements, see above. For the second session, each student requires table space for sewing and cutting and access to an electrical outlet. An ironing station will be required for every three students. Instructions for the Circles embroidery can be found on p. 72. Instructions for the Drawstring Pouch project can be found on p. 68. Embroidery stitch instructions start on p. 18. Advanced embroidery techniques start on p. 32. 1. Cut fabric for pouch front. 2. Transfer Circles design onto fabric, positioning it as per instructions on p. 68. 3. Place fabric in hoop and tighten. 5. Go over instructions for washing and drying embroideries at home (p. 17). At home (prior to second session): Students should wash and dry the embroidery to remove pattern marks, following the instructions on p. 17. 1. Cut fabric for remaining pieces.